Cobblers boss Keith Curle admits there’s ‘a lot of hard work’ ahead but he has vowed to ‘sort out’ his side’s leaky defending after they shipped another three goals at Newport County on Tuesday night. 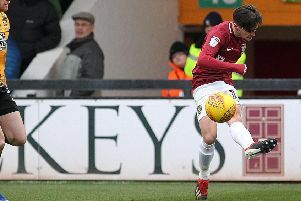 Curle initially tightened things up having taken over a defence that let in goals for fun, but after conceding five in his first nine games at the helm, the Cobblers have shipped 10 in the last four. A 3-2 loss at Lincoln in the FA Cup was followed by 2-2 draws with Exeter and Grimsby in the league,but Town’s worst defensive display under Curle came in south Wales on Tuesday when they fell apart in the first half, conceding three goals inside 33 minutes. That paved the way for only their second defeat in 10 league games. “I thought we were just lacking in certain areas,” said Curle. “Sometimes we got good possession of the ball but didn’t use it well and we got into some good areas but again didn’t use it well. Curle introduced a new system for the game, playing 4-4-2 with a diamond in midfield, but he refused to use that as an excuse for their poor defending. He added: “We had players playing not at 100 per cent with injury, with fitness and with players coming back in as others couldn’t play, so we tried to put out a formation that suits our personnel and also gets us a foothold in the game. “Did the goals go in because of the shape? “It doesn’t matter what formation you play, if you don’t want to put your head on the ball in the 18-yard box and if you lose the first contact, it’s got nothing to do with the formation. “We zonal mark but, if you look back, we had four men marking one (for the second) and they had an overload at the back stick and you’re thinking that somebody on the pitch must realise that.